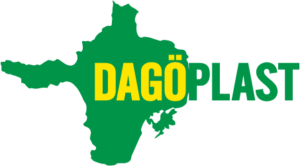 DAGÖPLAST AS manufacture trash bags and garbage bags, sacks & liners. Our products are designed to make waste collection & separation safe, clean and efficient and are even suitable for use with hazardous and dangerous waste, as appropriate. Kerbside separation of waste is now an extremely important element of waste management strategy worldwide. It reduces waste volumes, diverts waste from landfill and increases recycling rates. We manufacture specialist trash bags for all waste separation requirements including mixed, food & organic, plastic, paper and hazardous waste. Our compostable trash bags are certified, can be disposed of with organic waste and can be sent straight to industrial composting facilities, completing the natural cycle. Dagöplast AS can tailor your trash bags and garbage bags to your exact requirements, up to 3 + 3 color print. In addition, we offer bags in a range of sizes from 3 liter to 1000 liter. Mono layers and co-extrusion films up to 3 –layers. With our new product line RecyPolly produced by recycled plastic, we now offer our customers a more environmentally friendly alternative to products made of ordinary polyethylene for collection and handling of all types of waste. Recycled plastic is produced from already used plastic and is in contrast to virgin polyethylene more environmentally friendly, as the plastic is reused instead of going to landfills. incineration or ends up in the environment. All products normally produced in traditional polyethylene can be produced in recycled plastic. We have a large selection of bags, sacks and liners for everyone that wants to be more environmentally friendly in the waste management industry. Bags, sacks and liners in green polyethylene helps minimising the use of polyethylene coming from non-renewable raw materials. Products for the waste management industry include bags and liners 3 – 650 L, special bags and dog waste bags. BioBag offers easy and hygienic solutions for households and commercial kitchens, through our breathable bags, liners and sacks in a wide variety of types and sizes. BioBag offer both customized bags, liners and sacks and below you see our stock article assortment, available in bulk packaging. All our bags, liners and sacks are breathable and can be composted together with food waste. 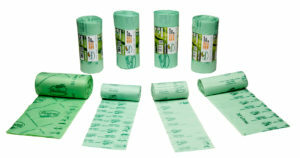 With our new product line GreenPolly produced in green polyethylene, we can now offer our customers a very environmentally friendly alternative to products made of ordinary polyethylene for collection and handling of all types of waste. 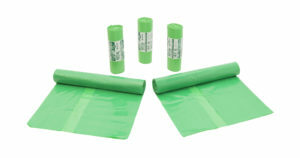 Green polyethylene has a reduced CO2 emissions when produced. Green polyethylene is a plastic produced from ethanol sugarcane, a renewable raw material. The traditional polyethylene uses fossil sourced raw material such as oil. 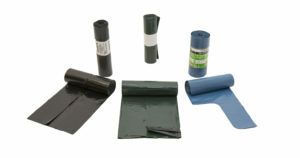 All products normally produced in traditional polyethylene can be produced in green polyethylene. We have a large selection of bags, sacks and liners for everyone that wants to be more environmentally friendly in the waste management industry. Bags, sacks and liners in green polyethylen helps minimizing the use of polyethylene coming from non-renewable raw materials. Products for the waste management industry include: bags and liners 3 – 650 L, special bags and dog waste bags.